It really is an age-old question. Do we want to celebrate our wedding with the setting sun, or under the stars, or inside a beautifully decorated celebration hall? You also may want to get married in a place that looks as good as it does in the pictures. Stone Creek is exactly that. Stone Creek sits inside a working pecan grove and offers the kind of outdoor wedding that you dream of. Fall, Winter, Spring, and Summer all have their unique appeal when your backdrop happens to be pecan trees as far as you can see. The photos of your wedding, and bridal party are sure to impress because of the unique setting we offer. Indoors or outdoors, Stone Creek is the most unique venue in the Lubbock area. One of the best things about Stone Creek is that we offer both indoor weddings, as well as, outdoor weddings. 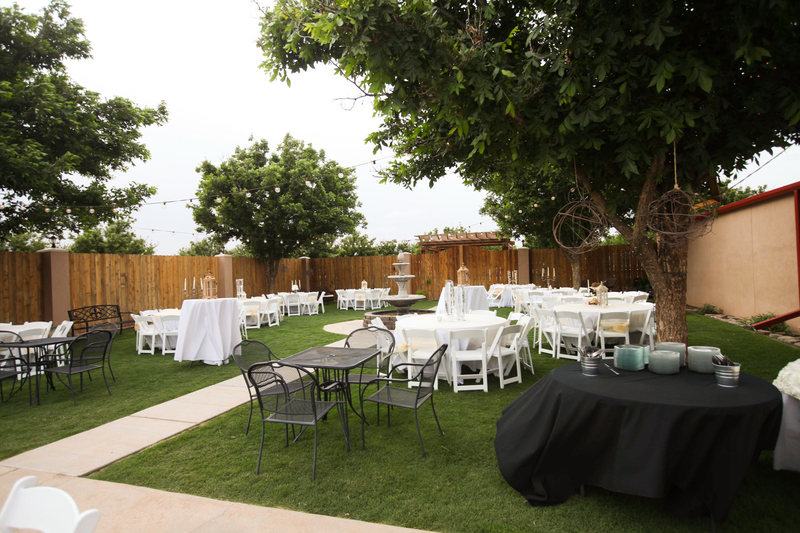 Other wedding venues in Lubbock simply do not offer this kind of variety, or versatility. Stone Creek, being the larger of the two venues available, offers both outdoor and indoor weddings which seating capacity that exceeds 300 in attendance. However, what many people do not know is that the Grove, our newest venue, offers exceptional outdoor weddings for slightly smaller congregations, but with the security of a large covered porch. The Grove may not be fully enclosed, but the experience of a wedding there is unique. The ability to celebrate under the stars, or dance the night away with a live band is something that other venues simply cannot offer. One of the biggest fears that people have when they are planning an outdoor wedding is the possibility of inclement weather. You don’t have to be from West Texas very long to know that the weather around here is as fickle as the women. We have seen outdoor weddings turn into indoor weddings only minutes before the ceremony was set to begin. However, in those cases, the staff at Stone Creek ensured that the transition was seamless and timely. There’s no way that we’re going to let a little wind, rain, or even snow ruin your day. We will do whatever it takes to make sure that your day is both special, and memorable. We want you to remember your day because of how perfect it really was, not for how much of a calamity it was. We will work to ensure that your day, come rain or shine, will be the experience you’ve been waiting for. When you plan an outdoor wedding with Stone Creek, whether are you use our main facility, or the Grove, you can rest assured that weather Will not be a factor in the experience that you have here. You can focus yourself on the celebration at hand, and be confident in the fact that the staff at Stone Creek Will ensure that you’re moment is everything you have hoped it would be. But in the end, we are still left with that age-old question. We can’t really guide you to choose between outdoor weddings or indoor weddings, but we can help to raise your confidence in the fact that whatever decision you make, you can know.